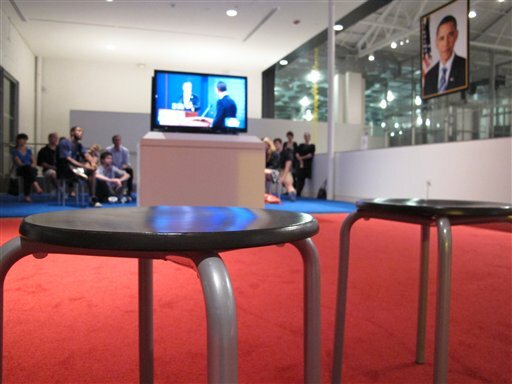 CAM Raleigh is hosting presidential debate screenings in conjunction with our exhibition Jonathan Horowitz—Your Land/My Land: Election '12. 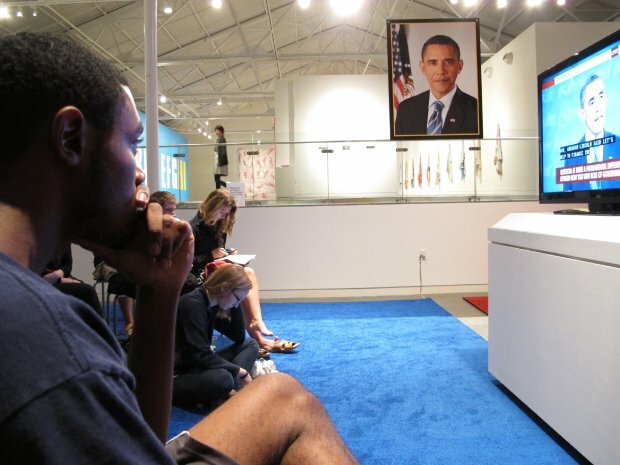 Read the Associated Press article below that covers the October 3 debate screenings around the country, including at CAM Raleigh. Like so many other Americans, David Becker knew long before Wednesday night's debate whom he'd be supporting in the presidential election. And, like so many other Americans, he tuned in anyway. He was hoping his guy — Republican Mitt Romney — would step it up a notch, "get out there and take command, put more on the table, tell us what you will do." "A guy like Romney should excite me," said Becker, 30, a Republican who manages real estate investments in Fairfield, a charming shoreline town on Connecticut's affluent "gold coast." ''But he has not done that." That was before the 90-minute head-to-head matchup between Romney and President Barack Obama in Denver, their first of three debates before Election Day. After it ended: "I think he had Obama on the run. I was pleased to see him finally take the gloves off." And so it went on the night of the Great Debate in a country ever more polarized and an election year where most Americans, the pollsters tell us, have already decided whom to choose. Across the land — from an art museum in North Carolina to college campuses in California and Iowa, a retirement community in Florida and Becker's home along the Long Island Sound — debate-watch gatherings were filled with partisans whose minds were pretty much made up before the candidates opened their mouths. The debate itself didn't change their votes. But the exchange did serve to reinforce their decisions. And perhaps even more importantly for Romney, who has lagged in national polls, the night brought with it a sense of relief and excitement for Republicans who were worried their nominee might not have what it takes to beat Obama. "Romney far succeeded my expectations," said Republican Art Rotelli, who joined a mixed group of Democrats, Republicans and even one undecided voter at Becker's house to watch the debate. Before things got started, Rotelli had some tough words of advice for his candidate: "He needs to provide a clear contrast, on health care, on the economy. "He needs to stop coming off as too careful." Afterward, the 35-year-old advertising product designer was dreaming of an Election Day victory. "Tonight is a game, it's not the Super Bowl. The Super Bowl is in November. ... I'd say Romney got a pretty solid lead in this game." Even some Romney opponents begrudgingly gave the debate "win" to the Republican. "I'm a Democrat, but Romney was on fire tonight. Romney was aggressive, he attacked. ... I thought he did exceptionally well tonight — unfortunately," said Karl Amelchenko, 36, a lawyer from Raleigh, N.C., who watched the debate at the city's Contemporary Art Museum, with one half of the concrete floor covered in red carpet, the other in blue. Still, Amelchenko said, nothing he saw or heard will change his vote for Obama. "No," he said. "I mean, my mind was made up long before." The museum event was meant to be bipartisan, but of the 30 or so people who showed up, all sat on the blue side of the room. Among them was a pair of registered independents — Emily Millette, a software interface designer for IBM, and boyfriend Austin Reid, a physics doctoral student. Both came in leaning toward Obama and said they heard nothing to push them into the Romney camp. "Truth be told I came here because it's an art installation, and I came here to be entertained," said Reid, 27, who planned to spend a few days fact-checking what he heard. Unquestionably, the debates are among the most important events of a presidential campaign season. They attract more viewers — the first debate especially — than the candidates' convention acceptance speeches and far more attention than the avalanche of ads that many a voter may simply mute, said Bill Benoit, a professor who specializes in political campaign communication at Ohio University in Athens, Ohio. They do have the power to potentially sway an undecided voter or switch a tentatively decided voter, he noted. But mostly, the debates could serve to fire up partisans to give of their money and time to help their candidate win. "That matters," said Benoit, "especially this year because both candidates have to raise money in the general election like never before because they declined federal financing. Strengthening your existing attitude toward a candidate can be more important now, this year, than ever before in history." That certainly happened for debate watchers at The Princess Martha, a 55-and-over apartment community in the heart of downtown St. Petersburg, Fla. About 10 residents gathered with popcorn and lemonade in the building's theater room to watch the debate on a big-screen television. And most of those sitting in the comfy black leather seats had no doubt about whom they were supporting: Obama. "I'm a very strong Democrat," said Mary "Ches" Applewhite, a 77-year-old retirement government worker who said she wouldn't even consider voting for Romney. "If he had stayed as moderate as he was in Massachusetts," she shrugged. "But he's not, now." The issues of Medicare and Social Security are paramount for this group and as the debate went on, Applewhite nodded vigorously when Obama said that he didn't think "vouchers are the way to go" with Medicare. Fellow resident Norton Klipstein, 86, felt that Romney put some pressure on Obama. Nevertheless, the performance did nothing to sway this Democrat's vote, either. "I felt there was a greater integrity in Obama's expression," Kipstein said, adding that Romney "smiled too much." At a gathering at the University of Southern California in Los Angeles, geology major and first-time Republican voter Charles Epting was himself grinning widely after the debate, believing that his candidate hit a homerun. "Where Romney really set himself apart is he wasn't the stereotype of this old, rich white guy," said Epting, 19. He especially praised Romney's vow to cut public broadcasting by joking that he loved Big Bird and Jim Lehrer, the former PBS newsman who moderated Wednesday night's exchange. Epting believed that helped show that Romney can use humor and charm to voice his convictions. "Tonight I think he was the more charismatic candidate." Still other voters walked away from this first debate craving more specifics about the issue of the day — the economy — and other topics that went unmentioned during a discussion intended to focus on domestic issues. About 40 University of Iowa students in professor Cary Covington's classes on the American presidency gathered in the rotunda of the Adler Journalism Building to watch the debate on a bank of TVs. The students participated in an experiment to test a mobile app developed by political scientists in which they responded to the candidates' statements in real-time by pressing buttons on their computers and phones reading "agree," ''disagree," ''spin," or "dodge." Many students said they were watching their first presidential debate, and voting for the first time this election. Toward the end of the debate, they sat up and paid close attention as Obama talked about how he reformed the federal student loan program — a major issue in a state where college graduates have some of the nation's highest debt loads. At least two were seen pushing "agree" on their phones. Among the group was junior Kate Resch, 20, a native of Springfield, Ill., and self-described political moderate who supports Obama. She was stunned that two of her top issues — abortion rights and funding for Planned Parenthood — didn't even come up. She said she wanted to hear the candidates in their own words rather than in the ads she's seen. "It was an important topic that should have been brought up," she said. In the all-important swing state of Ohio, Sylvia Bly of Cleveland was downright angry after the debate, frustrated with what she called Romney's lack of specifics. At 55 years old, Bly is struggling to find work since being laid off by a consumer products company in 2005. Her husband, a steelworker, lost his longtime job at a steel mill but was buffered by union benefits and has since gotten a new job. They lost his pension and have dipped far into their retirement savings as they try to get by. Obama's "mindset supports people like my husband and myself who are caught in the middle," said Bly, who nevertheless plans to watch the next debates as well — to see if Romney offers more detailed proposals, but also because she wants to know everything she can about whoever will be the next president. "I want to know that the people who are running for office truly have my interests and my fellow Americans' interests at heart," Bly said. "The person I might not vote for may become president. I want to know what to expect." Contributing to this report were Associated Press writers Helen O'Neill in Fairfield, Conn.; Allen G. Breed in Raleigh, N.C.; Tamara Lush in St. Petersburg, Fla.; Shaya Tayefe Mohajer in Los Angeles; Ryan J. Foley in Iowa City, Iowa; and Andrew Welsh-Huggins in Columbus, Ohio.